I just want to emphasize how refreshing it is that, thanks to the Switch’s success, trolling has completely vanished from investors Q&A. It’s so much more productive. How do you see this business partnership with Cygames differing from the one you have had with DeNA to this point, in terms of the partnership itself, the genres you will work on, and how much of the development load each company will take? We just announced the business partnership with Cygames today, but let me say that we are very much satisfied with the various projects and areas in which DeNA has given us their support, and we want to continue our relationship with them. That said, we are in the midst of expanding our lineup of smart-device applications, and Cygames has come up with a very interesting game application plan. We felt it was very important to collaborate on development and operations so it could be released as a Nintendo smart-device application. To this end, we formed a business partnership with Cygames and acquire a portion of their issued stocks. 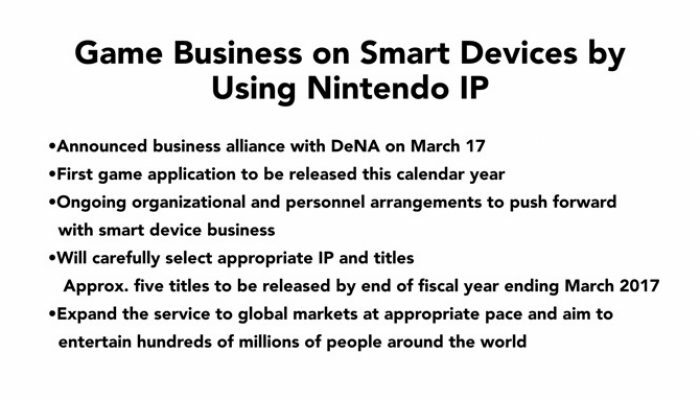 DeNA provides technical and developmental support for our Nintendo Account system in addition to the smart-device business, so we expect the relationship between Nintendo and DeNA will continue in these areas. That is one of the ways that our business partnership with DeNA differs from the business partnership with Cygames. Ongoing, there is the possibility that we will join with other partners to further expand our smart-device business if needed. Director Furukawa, as the new president of Nintendo, which of your roles do you consider will be most important? Also, what issues are you currently looking at, and which ones do you want to actively tackle? President Kimishima said that just building up cash reserves is not all we need to do, and that he wanted to consider ways of using that money effectively, so I wanted to follow up on how you think you would put that cash to use. The company will be managed by the members of a new executive management committee under a next-generation collective leadership system. Mr. Kimishima has shown through his own actions what it means to manage a company collectively rather than relying on the efforts of a single person, and I understand my role as one of continuing on that same course. We have executive officers in charge of hardware development, in charge of software development, and in charge of sales and marketing. 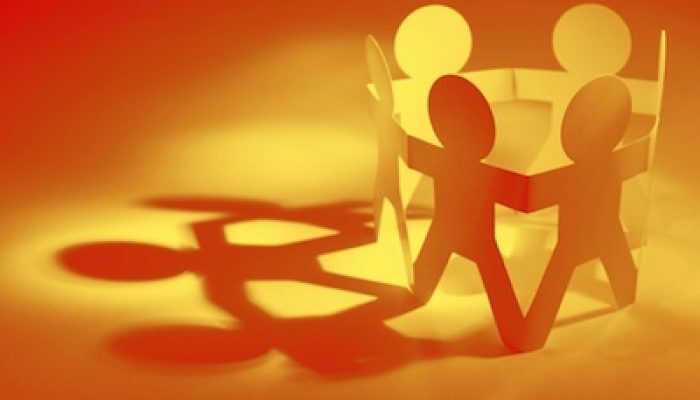 They all have their different strengths, so I intend to have frequent one-on-one conversations with them, share any background or context behind how things are done, and do everything I can to be mindful of engaging in management together as a team. As for issues, my highest priority task right now is to accelerate the momentum behind Nintendo Switch and to expand the business. Other issues include the question of how to expand our smart-device business, and whether we can nudge the scale of that business into a larger portion of our overall business. I am also looking at the topic of the yet-to-be-realized theme park and movie projects that are part of our strategy of expanding the number of people who have access to Nintendo IP (Intellectual Property), and how we can lay down new pathways that positively enhance our dedicated video game platform business. With regards to the use of cash reserves, we managed to turn a substantial profit in the previous fiscal year (ended March 2018), as was announced. And as you can see in our Earnings Release, the annual dividends this time total 70.8 billion yen. And if you read through the statement of income, you will see that we need to pay corporate income tax and some other taxes. So even though our profits grew, that does not necessarily build up more of our cash reserves, because we have those dividends and taxes to pay. At its core, the Nintendo business revolves around creating new and innovative content, so that is where we must invest the most. We want to keep consumers engaged, and with technology advancing at such a tremendous pace, we will want to consider investing in parties that have technologies we feel are a good match for Nintendo, if we can find them. I cannot provide any details at this time, but we are looking at all kinds of possibilities, and will continue to do so. When I look at consolidated sales by region (as described in the Earnings Release), I get the impression that sales in the “Other” region (outside of Japan, the Americas, and Europe) account for a relatively large percentage of Nintendo Switch sales compared to previous platforms. I would like to hear about your efforts in these “Other” regions. What specific countries and regions are included? And has your thinking about their business changed? Going forward, how do you envision the “Other” region and how large do you think it will grow? Our consumer base in Asia and the Middle East is growing, and there is no denying that “Other” region sales are increasing. The cause behind this growth is the expanding number of people who have access to Nintendo IP through our smart-device business. We conduct sales through independent distributors in regions that lack the kinds of direct sales offices we have in the US and Europe. In particular, a growing number of consumers in Asia and the Middle East are interested in purchasing Nintendo Switch, and that is boosting sales in the “Other” region. I expect the scale of that business to expand more and more. It is essential that we stay on top of the market situation. I cannot say with certainty how large the market will grow, but we do plan to work on expanding the scale of it. We especially want to expand the business in Asia, the Middle East, and Central and South America. Given the ways you are changing how Nintendo IP is presented with your smart-device business and theme parks and a movie, why did you decide to replace the person acting as president and representative director at this time? I’d also like to hear your reasons for deciding that Mr. Furukawa was the right person moving forward. I was asked about my duties when I took over as president while Nintendo Switch was still in development, and one of my biggest responsibilities at the time was to launch that platform and get it to consumers just as we had envisioned. My second role was to change our directorial structure to speed up decision-making and execution on a variety of projects that members of the management team were considering at the time. It takes people to support that, and it was essential that we build a structure that allowed the new generation to play an active role. As we progressed with delegating authority, including the authority for corporate governance, we created a system where our younger senior managers would be able to act. In the past two-plus years, they have shown what they are capable of accomplishing. Our latest financial results are far better than I originally forecasted, which speaks to the fruits of our efforts to date. My successor, Mr. Furukawa, worked with me as General Manager of the Corporate Planning Department to advance our operations. He has fully fleshed out what this non-traditional collective leadership system we created will be, so I believe this is the perfect time (for a change of president). With the breadth of projects we are working on, now is the time to transfer power further to new people and to promote a generational shift to bring stronger momentum to Nintendo through these changes. You sold 15.05 million Nintendo Switch hardware units last fiscal year and you forecast sales of 20 million units for this fiscal year (ending March 2019). What is the basis to that estimate? I believe the stock market consensus is even higher than that, so if the demand is there, how much higher can sales go? In past comments, you have said you expect Nintendo Switch to have a long life cycle. Looking at sales to date, do you think that likelihood has increased? 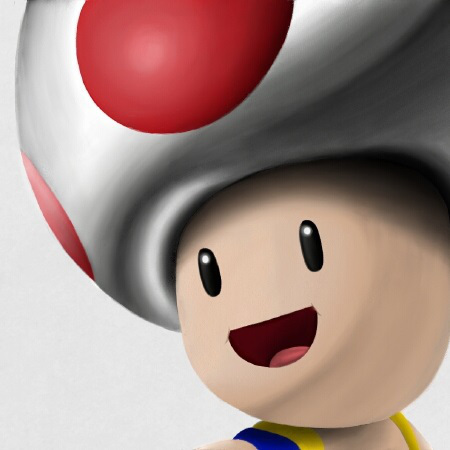 Specifically, do you see lifetime shipments reaching the 100 million units like Wii did? As we discussed earlier, seeing how far we can expand the market in the second year of sales is incredibly important for a video game system, whether it is a handheld game system or a home console system. For the launch of Nintendo Switch, we conducted a variety of activities aimed at Nintendo fans and avid game players who we thought could be interested in Nintendo Switch, and I would say this yielded good results. In this second year, the initiatives we are planning come from our recognition that we also have to challenge ourselves to delivering Nintendo Switch into the hands of consumers who have never played a Nintendo platform before, and to those have played before, but not recently. We set a sales target for the Nintendo Switch hardware of 20 million units during this fiscal year because it is essential that we exceed the 15.05 million units sold last fiscal year, and in order to sell more units than we did last fiscal year, the software lineup we have planned is meant to attract people including those who have not been playing video games recently. We have reached a consensus across the entire organization, including our overseas subsidiaries, to work towards reaching this level. That number of 20 million units is not one we will reach easily, but I believe we are primed to do it. As for the Nintendo Switch life cycle, we need to steadily provide new experiences that will keep consumers always wanting to play Nintendo Switch in order to maintain sales for a long time. I cannot go into detail here today, but our company has a lot of experience with selling gaming systems, and we will actively incorporate everything we have learned, including our failures, into our planning. Changing environmental factors, including the activities of other companies, can impact the Nintendo Switch life cycle. So the benchmark is not whether Nintendo Switch sales can surpass total Wii sales, but rather how we adapt and respond to changes in the market and strive to continue selling Nintendo Switch as long as possible. The collaboration between Nintendo and Cygames to develop and operate an original smart-device application called Dragalia Lost is a little different from your practice to date of developing Nintendo IP for smart devices. Has your thinking or policy changed with regards to the market for smart-device applications? Why did you select Cygames out of all the companies developing applications for smart devices? How we think about smart-device applications has not changed in any fundamental way from before. First, we want to expose Nintendo IP to more people by using our IP in smart-device applications, and ultimately achieve a synergistic effect with our dedicated video game platform business. Second, we want to make the smart-device business one of our pillars of revenue. It is not enough to simply expand our in-house development resources to achieve these goals, so we have been looking for teams outside of the company that we find interesting and we can work with on development. We felt that the application being designed by Cygames called Dragalia Lost is interesting, and that it aligned well with Nintendo’s concept, so we forged the business partnership with Cygames on the idea that it would enhance our own development resources for smart-device applications going forward. And to reiterate, we have built a very good relationship with DeNA that we intend to maintain. If we find other partners that can bring unique strengths that are not found within Nintendo, then we may work with them as well. When the late Iwata took the post as president, the prior president, Mr. Yamauchi, was said to have claimed that “the president of Nintendo needs to be a little unusual.” So, I want to ask Mr. Kimishima what important criteria you used to select Mr. Furukawa to be president, and why you thought he would fit that bill. Also for Mr. Furukawa, what kind of company do you want Nintendo to become? Please describe the future direction, or touch on the organizational structure or other measures. I have my own thinking about why Mr. Yamauchi talked about being unusual when he named Mr. Iwata as president. Mr. Yamauchi worked for more than 50 years in the game business and he stubbornly stuck to his beliefs. He always felt that software is key to the game business, and that creating the software naturally takes time and labor as well as money, and that you have to go all out and never quit. He also always felt that the purpose of the hardware is to bring the best out of the software, and he never changed his thinking on this. I imagine he would say that a person who would readily bend Nintendo’s core attitudes would be unfit for the job. In a sense, he was calling for a stubborn person, or as he might say, a thoroughly unusual person. My understanding is that he used that word to mean someone who would not change, no matter what other people or what other companies said, and would want to preserve any aspect that makes Nintendo different from the others. As to whether Mr. Furukawa is in any way unusual, I can just say he has extremely strong inner fortitude. He has clear and articulated opinions, he understands the Nintendo point of view, and he can express that to everyone in his own words. The Corporate Planning Department (headed by Mr. Furukawa) has the important mission of conveying the Nintendo point of view to all employees, including people involved in development and sales as well as people in other countries. It is important that the department remain on point no matter where the conversation leads, and he has been extremely competent at that. Another component has something to do with the fact that more than half of Nintendo’s 5,500 employees work outside of Japan. It would be hard for anyone to lead Nintendo if unable to directly communicate their views to overseas workers, including those in important senior positions, or if they could not make decisions quickly, and lacked the capabilities to follow through. That is why I see Mr. Furukawa’s overseas work experience as something that makes him a good choice for our new president. After Mr. Yamauchi’s presidency, there was a change in the environment surrounding Nintendo, where no longer could any single person decide matters on their own. That was the start of the collective leadership system that I, too, have carried on. In my view, Mr. Furukawa’s role as president is to bring the best out of the excellent people responsible for software development, hardware development, sales, and marketing. He must steer Nintendo as a whole, and push for the points that must not change. The executive board resolved to choose Mr. Furukawa as the right person for that role. The one thing we must never forget when running Nintendo is that we are a company that makes entertainment products and playthings, not necessities. It is a business where our mere existence could be quickly forgotten if consumers stopped considering our products to be fun and interesting. No matter how the era or the environment changes, the essence of our business will not change. It is a high-risk business, so there will be times when business is good and times when business is bad, but I want to manage the company in a way that keeps us from shifting between joy and despair. As for the question of what kind of company I want to make of Nintendo, this is a company that continues to be an integrated hardware and software business in the world of dedicated video game platforms. We work hard to keep the odds of success in our favor, but there are times when things go well, and times when they do not. This is a high-risk business by its very nature, and that will not change. But we need to be a company that continues to ask ourselves what we can do to maintain our relationships with consumers, and how we can leverage our ingenuity to mitigate the risks even a little bit, and never come to the conclusion that there is nothing we can do. As Nintendo Switch enters its second year of sales, I expect the purchase demographics are changing. Do you think Nintendo 3DS can coexist due to its differentiated price and features? You say you want to popularize Nintendo Switch to the point where every person has their own, so do you plan to capture the demand that is now directed at Nintendo 3DS? Consumers purchased Nintendo 3DS systems in numbers we expected last fiscal year. It has an ample software lineup at a price point that makes the system affordable especially for parents looking to buy for their kids. We expect that demand to continue during this fiscal year as well, so we will continue to sell the product. Given that Nintendo Switch is a home gaming system that can be taken on the go, this situation may change if it grows from being a one-per-household system to a one-per-person system. But the price of Nintendo Switch is not something with which most parents would buy a system for every one of their children in a short period of time. Moving forward, we will work to ascertain what kinds of play people want at which price points, and as long as there is such demand, we will continue to sell the Nintendo 3DS system. I see the product coexisting with Nintendo Switch at this point in time. Your collaboration to date with DeNA is painted as one where Nintendo takes the leadership in application development and DeNA handles the back end. But are you starting your collaboration with Cygames with that company as the driving force for planning and development of Dragalia Lost and Nintendo in a supporting role? Can we expect Cygames to release titles using Nintendo IP in the future? Dragalia Lost was originally designed by Cygames, but we thought it was an interesting application and got involved at the planning stage and are now developing the game together. The planning and development team for Dragalia Lost is extremely compatible with our own development teams, and I think they will be a valuable team to work alongside for the future development of our smart-device applications. And with regards to future development, I am not looking at this in terms of whether to use Nintendo IP or come out with new designs from Cygames. As a development team, they are first and foremost a very important new force for us, and we want to collaborate with them to create new applications. Are you still in discussions with partners in China about entering the Chinese market? Have you signed any agreements or contracts yet? Is that a high priority for your business? We are aware that there are many consumers in China who want to play games made by Nintendo. It is my belief that they would like to have the same experience as those who enjoy playing Nintendo games in other countries, and we have been looking for a way to make that happen that for over a decade. However, we have not realized it yet. Nintendo cannot expand its business into China on its own. Many partners have approached us about collaboration, but deciding on a partner is not going to solve every issue right away. The issues that need to be resolved are many, and we are in several ongoing discussions to figure out how to do so. We have not yet gotten to the stage where various basic contracts have been signed, but our desire to get that done as quickly as possible has not changed. During the presentation, there was talk of dissatisfaction with the current scale of the smart-device business. Can you give us any specific quantitative targets that would be satisfactory for the smart-device business, such as sales targets or a number of titles release annually? You have said that Nintendo wants to release two to three smart-device applications per year, but only one title was released in the last fiscal year. How many titles for smart devices do you think you can release this fiscal year by partnering with Cygames? Cygames is an equity method affiliate of DeNA, so is there a chance of a three-company collaboration between DeNA, Cygames, and Nintendo? We still want to release two to three titles a year in the smart-device business. That thinking has not changed. And at the present time, we have no intention of rapidly increasing this number each year. What we want is to release applications for smart devices that can be played for a long time, and if we can increase those kinds of titles, then we will build a lineup of titles that consumers will truly enjoy. Right now, there are not very many titles yet. I expect to see an increase in sales come about when we are able to present consumers with several enjoyable applications, including those that have already been released. I cannot give you any specific monetary targets for sales, but suffice it to say that the amount we are currently not satisfied with is in the tens of billions of yen. As for whether there would be any collaboration with DeNA, Cygames, and Nintendo, I would say the explanation I gave about our collaboration with DeNA still applies. The new collaboration with Cygames involves game design and development, while DeNA supports the all-important Nintendo Account system, so the roles these two companies play are different. In a sense, we already have a three-company collaboration. But at the present time, there are no plans for the three companies to directly work together on the development of any new applications. How will Nintendo Switch Online be positioned within the Nintendo Switch business? With service scheduled to begin in September, what contribution do you expect it to make to the financial results during this fiscal year? Also, have expenses for preparing the service been factored into the first half (April-September) forecast? You will be able to read details about Nintendo Switch Online on our website in early May, but we are positioning the service as one means of increasing and enhancing the fun of playing Nintendo Switch. As we are preparing for the start of the service, costs have been incurred during this first half, but we do not expect the amount to be especially large. 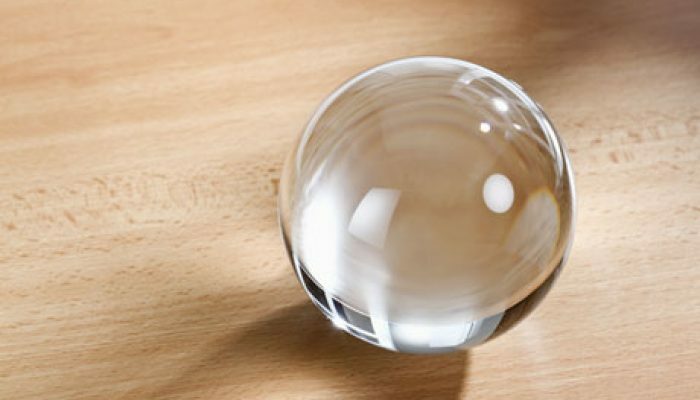 We are not discussing specific numbers with regards to sales after the paid service starts, but that has likewise been factored into the forecast for this fiscal year. What is your take on the digital sales percentage of 17.3% last fiscal year? Where do you expect that percentage to stand two to three years from now? If the launch of the Nintendo Switch Online service boosts the percentage of digital sales, what impact do you think that will have on the stability of revenues? I expect the percentage of digital sales will rise steadily in the years ahead. Consumers have grown accustomed to getting digital content, which is a trend that is clearly visible in the way consumers in North America and Europe purchase titles, and especially in the sales performance of titles from other publishers. Even so, there are also many consumers who purchase only packaged software, so I do not see digital content taking over all of sales. The sales ratio also differs for every software title, depending on factors like content and the age and type of consumers making the purchase, so I cannot predict how high the percentage of digital sales will rise for Nintendo. That being said, the percentage of digital sales has already risen above 50% on some titles released by publishers outside Japan, so I definitely think the percentage will rise for us. As for the contribution to stable revenues, no contribution will be made if the percentage of digital sales increases but total unit sales of software declines. It is more important to create interesting titles that consumers want to buy.